Now available in a 22 oz. spray bottle for smaller jobs. CitriSurf® 2310 is a high quality blend of chemicals formulated for cleaning, rust removal and passivation of stainless steel products. It is provided in a high viscosity form for easy application on weld joints, vertical surfaces, and other large items or areas that cannot be conveniently dipped in a bath. 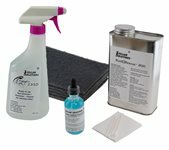 CitriSurf 2310 is specifically designed to provide low cost and efficient removal of all rust and free iron from the surface of stainless steel and other metals, providing the highest chrome oxide levels possible. Citrisurf 2310 is also available in 1-gallon and 5-gallon containers. Application Procedure: To assure best results, the parts to be treated should be thoroughly cleaned to remove dirt, oils, and grease with an appropriate cleaning solution prior to treatment with CitriSurf 2310, although it is very good cleaner by itself if used properly. If thorough cleaning is not possible during use in the field, wipe the surface free of dirt and oils prior to application. All equipment, mixers, applications or pumps should be clean and dry prior to use. Only containers constructed of polypropylene, polyethylene, or other acid resistant plastic and stainless steel should be used to hold or store this products. Depending on the product being cleaned, passivated, or brightened, dilution of the CitriSurf 2310 with water at maximum 1 to 1 ratio volume may be advantageous or necessary to slow down the reaction rated or lower the viscosity. Time, temperature and concentration of the product should be tested prior to use in production. For more aggressive cleaning or rust removal, longer times, higher temperatures and higher concentrations are advantageous. Each application is different. Prior to use, mix thoroughly by shaking or stirring. CitriSurf 2310 should be applied liberally to the surface to be treated with a sprayer, brush or roller. Coverage is approximately 50 square feet. Wait approximately 10 to 30 minutes, depending on the application, and then rinse the product from the surface completely. Repeat process if needed to obtain desired results. Difficult rust or corrosion must be tested to determine the exact best conditions for removal. If heavy rust needs to be removed, Norton Bear-Tex Pads; or other non iron containing abrasive pads may be helpful. Note: CitriSurf 2310 must remain moist during the treatment period. When using CitriSurf 2310 in direct sunlight or other hot environments, it may be necessary to periodically sprinkle the surface lightly with water to keep the CitriSurf 2310 from drying. Rinse thoroughly with clean water and dry completely in air immediately. Drying can be accelerated by use of a hot air oven or other drying medium such as an air blower (hair dryer) to attain a clean, dry surface prior to post treatment or packaging. Q. What is the difference between Citrisurf 2210 and Citrisurf 2310? A. Both passivate stainless steel. The Citrisurf 2310 also contains a rust remover. Q. Will 2310 remove weld discoloration on stainless steel? A. While 2310 is recommended for passivating stainless steel after welding, it does not remove the cosmetic discoloration that welding can leave.